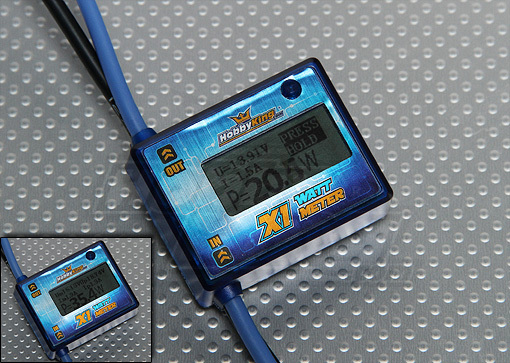 Hobby King X1 is very compact and accurate wattmeter and power analyzer. Equipped with special current sensor for high precision and low resistance. Predict model airplane flight time with any given propeller, Ensure safe peak currents for motor, ESC, wiring and connectors. Check battery health and performance, Measure power and energy consumption of ANY device with a battery. Up to that X1 wattmeter records Highest and lowest voltage, Amps and highest watt reading. Also it has voltage measurement trimming interface, which allows to adjust the voltage drift.